Do you want to get away from it all? Escape to a place where life does not move so fast. Come to an area where the people are nicer and the stars are brighter. Here, where the days are clearer and the air is cleaner, you can leave your tension behind. Welcome to White Pine County, eastern Nevada. 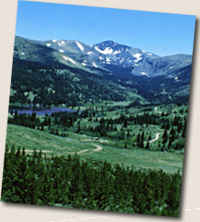 A perfect blend of vast open space, wilderness areas, and national park attractions make White Pine County unique. The therapeutic effects of the high desert landscape make eastern Nevada the ideal place for you and your family to vacation or live. The Freemont, Shoshone, and Paiute Indians first inhabited eastern Nevada over 1,000 years ago. In 1826, Jedediah Smith became the first European to behold the area. Over the next 40 years, other explorers followed. The path of one famous explorer, Howard Egan, later became the route for the 1860 Pony Express. During the 1860s, many mining towns prospered and failed. One of the biggest booms occurred in 1867 when over 30,000 people rushed to the slopes of Mt. Hamilton in White Pine. By 1869, the county was officially formed. In only six years, the ore supply diminished; all work ceased. Much of Hamilton burned in the fire of 1887, and the State Legislature named Ely as the new county seat. Ely remained sparsely populated until a significant discovery of copper ore. In 1906, the Nevada Northern Railroad spawned the development of the copper industry. Towns like Ely, McGill, and Ruth were born. Copper remained king in eastern Nevada until the 1980s. Today, both mining and tourism are the basis of eastern Nevada’s economics. Thousands visit eastern Nevada to relax, unwind, and experience the real American West. Find out more about White Pine County.